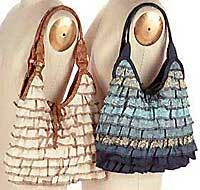 This flirty feminine purse features ruffles galore with serged edges highlighted using variegated or contrasting thread. The ruffles can be made using jelly rolls or 2 1/2" strips of your favorite fabrics. There are two handle attachment options included; one handle is attached directly to the purse, while the other handle is connected with rings. An inside pocket completes the purse. Size 13" x 23". Twelve fabric strips 2 1/2" x 44" long - use jelly rolls or cut your own.